Our borrowed pet Chloe is a stalker, a cricket stalker. I don't think she tries to be sneaky, but since she's quiet, she seems to be stalking the crickets we give her to feed. I think it would be fun to get her out of her vivarium and have her hunt her prey in the open range of our kitchen. This week, we've been casually baking and sewing and wood carving and sketching a self portrait and reading for fun. And watching tv and using computers, too. We had my FIL over for dinner (stir fry) since he's 'bach-ing' it for a week, and had a little card playing with him afterward. "I" of GAIN decorated the church for Advent. She LOVED it. I also took a lot of food pictures this week for the food + foto challenge at the Souvenir Foto School. I'm halfway through the challenge (see my submission this week at my new blog), and I'm determined to have a different knife in each of the remaining weeks. I always take many many many pictures before I choose my selection. This week, my photo pool included the apple peelings (pretty interesting), bagels (Martha Stewart styling and food ad styling), and pies. I keep the guiding words of the incredible Sarah in my head at all times, "It's hard to make food photos not look like barf." So true. 1. having a chinese water dragon is like having two pets -- the dragon is one and its prey is the second. 2. the prey would be a box full of crickets, which is really plural. 3. the crickets need to be fed, just like the dragon. 4. the crickets get food that is fortified with calcium, but we still have to dust them with calcium before feeding them to chloe. 5. chloe is almost out of crickets. Isn't the Chinese Water Dragon cute? My 16yo said, "We finally have a pet!" My kids have been blessed with a week-long visit from Chloe, a niece's Chinese water dragon. Delivered on Monday, she has been getting a lot of attention: frequent water mistings, cricket feedings, and exercise outside the vivarium. Humorous details later. Me to the kids: "Are you working on your math test?" No answer. I look into the other room and see this. 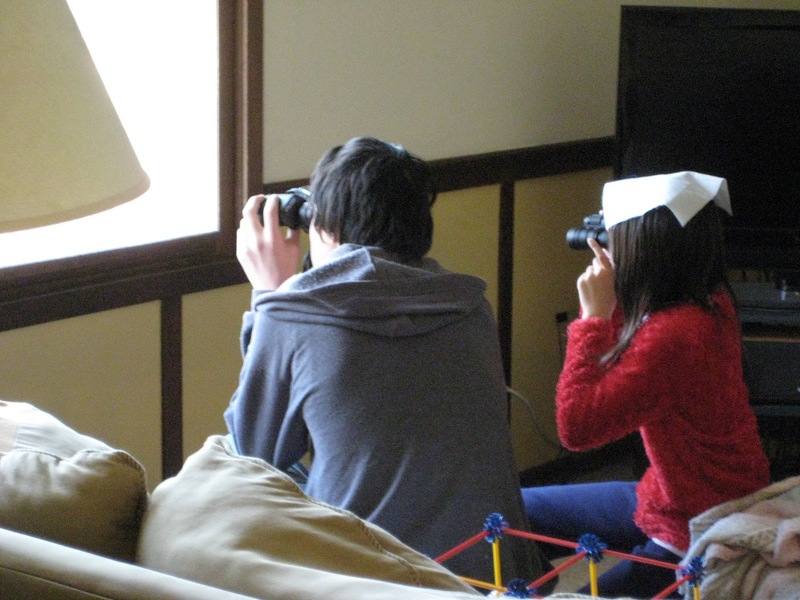 The kids are looking through binoculars so they can watch the rabbits better. "I" of GAIN has a quilt block on her head because it's fuzzy nap keeps her warm. "G" has a pendulum thing on the couch made of K'nex. This is our school day. After kids #2 and #4 and I worked to make our crazy blocks, I can finally say that the flannel scrap quilt is ready to make into a quilt top. Oh my. I have crossed the line into "older-ness" today by having my third child turn thirteen. If you live in my house and it is your birthday, you get to choose all of the family meals. You also get to skip school if it's a school day. For part of his birthday gift, we visited the Science Center. We spent a fair amount of time in the "Why the Sky" area, then finished up in the "When Things Get Moving" area. 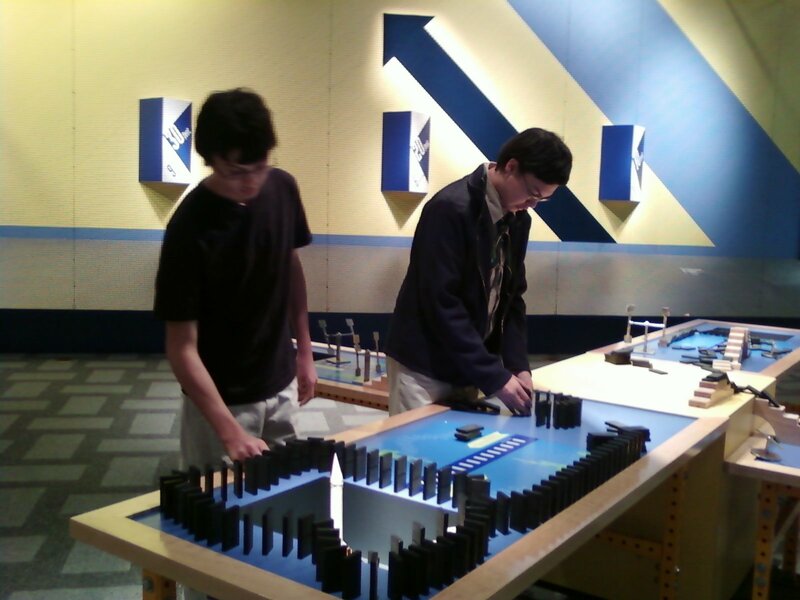 He proclaims a love for dominos, as shown in this video, which was the last of three domino chains that he made. His older brother assisted with this one. Who was there? I_Blog had speakers and registrants. The registrants, like me, came from a wide variety of backgrounds, representing several Midwest states. The speakers reflected the same. I can think of one who came from outside the Midwest, but I won't hold it against her. There were people with blogs and people who will soon have blogs. There were many like me who could not attend all three days. And there were some I did not meet. What did the speakers say? Lots. Jody designed two tracks -- one for beginners and one for experienced bloggers. Choosing one workshop per session was difficult at times. The experience was great. Having small audiences allowed for wonderful personal interaction and attention. The hotel had great ambience. I don't know if I can say more, other than I am still hungry for more. She is no newcomer to the internet, but here is Miss E's Sweet Shot Tuesday debut. I hope to have her featured in future SST's. 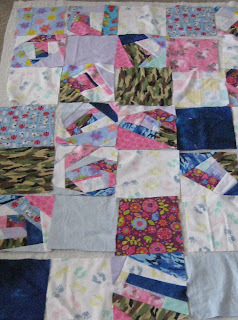 Until I get rid of blogspot, I have to live with no control over rotated photos. I've tried two different versions of this photo, and blogspot can't handle something that isn't orthogonal. Tilt your chin to the right. Isn't she sweet? In addition to the food buffet, we had a workshop buffet. So anyway, what did I do at a blog conference? Open a laptop and have everyone type posts as a group? NO!!! I learned how to make a blog “better." I really don’t like that word, but I can’t think of just one word that is suitable. Maybe "more effective" is what I want to say. I also heard business advice. Traditional business advice, given from a blogging perspective. Afterward, I remembered some words I heard about 15 years ago – as technology use increases, the need for human interaction increases. That is, the more you communicate through digital devices to buy stuff, converse, and do research, the more you crave contact with live people. Moral of the story: Networking! It’s all about networking. We also ate food. Good food. Some people don’t care about what they eat as long as it's food, but I do care. Coupled with the fact that I get hungry frequently, I definitely worry about food when I travel. Being a dancer and athlete probably works against me in this area. The Hotel Pattee provided great food for us. Having food provided was a convenience. We can maximize the networking and not worry about being late for an upcoming session because we left the building. And the food was a little fun. If there had been a tip jar for the omelet man’s Sunday brunch, I would have left one, even though he had to use a torch to light a faulty burner. The torch impressed me. And Midwest Dairy had yogurt, OJ, and milk for us at all times. i_blog was this weekend and I love love loved it! Attending the i_blog conference in Perry was fun and educational. I love meeting new people and new ideas. 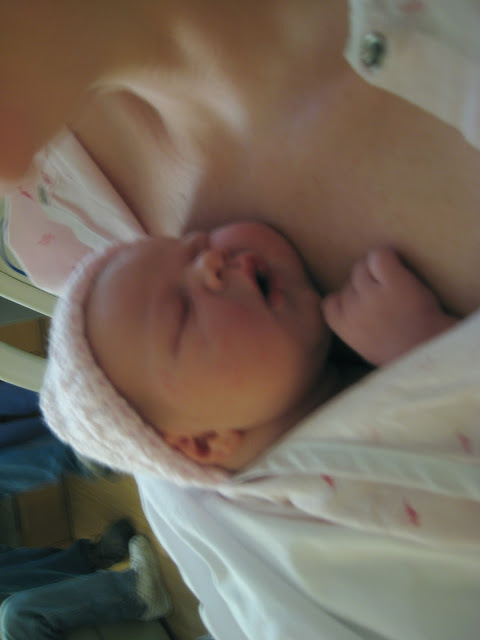 I promised my sister, who just had a baby on Tuesday, that I would tell everything on my blog. Swag? I didn’t go for the swag. But there were plenty of goodies – pads of sticky notes courtesy of Cozi, a notepad and $50 discount coupon from Hotel Pattee, Midwest Dairy generously gave an afternoon snack, recipe books, and insulated bags (they will fit two gallon milk jugs), and Land O Lakes gave coupons for free yogurt and cents off for cottage cheese. There were also fantastic giveaways: Kum and Go gave two $100 gift cards, Verizon Wireless gave a droid 2, Midwest Dairy gave a handheld blender (that I won! ), and Brett Trout gave two copies of Cyber Law. (I am too lazy to put an amazon affiliate link here.) Verizon Wireless had a booth full of goodies and info – drawstring bags, water bottles, key chain fobs, cozies, non-slip pads for your dashboard, ink pens, you get the idea. There could have been more on Friday, but I didn't attend that day. Well, are you jealous yet? You will have to go next year. Wait until my next post. Then you'll really wish you would have been there. OK, I have no pictures from the event right now. How about this one? As I told the dairy moms at our Saturday morning breakfast, we saw Toy Story 3 Thursday night, and everyone loved it for their own reasons. I found these forgotten toys recently on closet shelf. Our table seems to always contain a newspaper and book in the background. I just traded purses, from the every day small to the large enough to fit a notebook in. It's the i_blog conference. I've never attended a blog conference before, just thought about it and read about. This year, I'm doing it. It's my adult ed. I've got family members and a brand-new ministry in need of assistance in the blog arena. Leave me a comment with your most pressing blog question. I'll see if I can find the answer in person this weekend. They're here! The paste papers are here! Being the paper lover that I am, I had to enter LarkCraft's giveaway. Have you ever read any Laura Ingalls Wilder books? There is one part in a book that I relate to. Except instead of a cookie, it's paper. Laura says that her cookie is so beautiful that she almost cannot bear to eat it, because then she won't be able to look at the nice design anymore. She eats all around the edge slowly, trying to make it last. That is how I feel about paper. I've mentioned to a couple scrapbookers before that some paper is so gorgeous that I can hardly stand to cover it with another piece of paper or a photograph. Diane has elegant, lovely looking paste papers, and I am very inspired to use my winnings for greeting cards and bookmarks. If I use the paper as the centerpiece, I won't have feelings like Laura Ingalls did.